Last week's picture shows the top of Daniels Recital Hall, taken from about the 60th floor of the adjacent Columbia Tower. 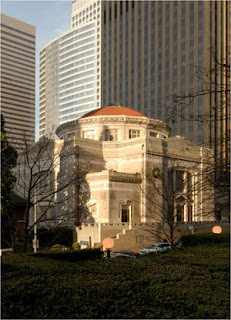 The First Methodist Episcopal Church Sanctuary occupies the North­east corner of the block bounded by Fifth Avenue and Marion Streets in downtown Seattle. Measuring 165 feet by 114 feet at its base, the building has a stone foundation and a façade of pressed brick and terra cotta. 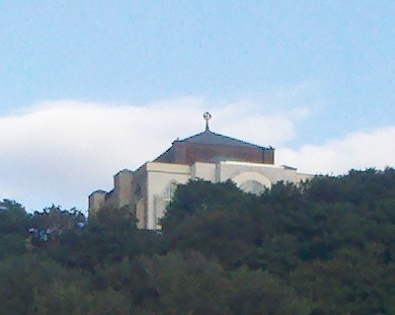 Its form is that of a rectangular box surmounted by a 66 foot high red tiled dome that is 64 feet in diameter.